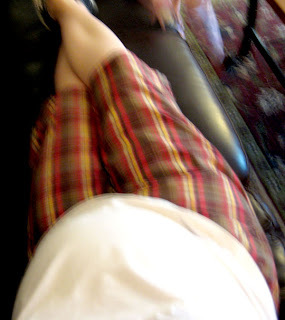 iderdider....: i'm not sure that plaid bermuda shorts are ever a good idea. i'm not sure that plaid bermuda shorts are ever a good idea. *Update: tonight a friend mentioned that she saw this picture on the blog and thought that Nate had very smooth legs. For the record: this picture is of me, not Nate. Also for the record: Lyna thinking that it was Nate made me even happier than that one time that Claire lifted Nate's shirt and said, "hi baby." You are not going to believe this but I was going to comment on how cute your shorts were the other day. Truly. They look awesome on you. Hear ye, hear ye, ignore this post because you know as well as I do that Kari is an awesome dresser (not the furniture) and she is adorable. I love the bluriness - like you couldn't take the picture fast enough. Nice! I love the shorts. I plan on getting myself some too.....as I can't wear normal shorts anymore because of my middle aged man beer belly (and I'm not even preggo) and nasty fat cottage cheese legs and thighs. You look adorable! BTW - do you have a name picked out yet? We're still working on a name. I thought we had one, but now we're up for debate again. If Lyna had stopped to picture in her mind Nate's face (and ears), she would have known that Nate does not have smooth legs.